Bay and Bow windows add such beauty to any home! 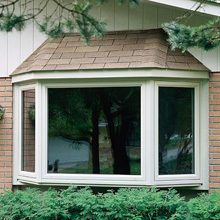 Bay and bow windows are curved and extend outward from your home. These windows are great for adding light, giving any room that larger, more spacious feel. These beautiful windows are made of up of 3 or more windows to form that outward curve. So you will need some space outside in order to install a bay or bow window. Energy efficient, bay and bow windows will help lower your energy costs by preventing the transfer of hot and cold air. When you have older windows, they may be splitting or cracked, thus letting in cold air in the winter months and hot air in the summer. The new energy efficient windows also contain low-e glass that prevent harmful UV rays from getting in to your home causing fading on your walls and even furniture. Our design experts can give you a free in-home estimate on installing new bay or bow windows in your Iowa, Nebraska or South Dakota home. 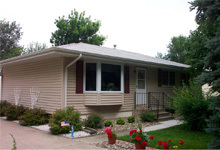 They add not only beauty and value, but will help lower your energy costs as well. Call us today or request a free in-home consultation. We offer a full window warranty and easy pay financing to help easy any hesitation you may have.